I will say, this is a play that requires a fair amount of outside knowledge; there were a few points where I looked up the history in order to give needed context. The play does not hold your hand, but for a piece that was performed in LA itself in 1993, and toured soon after the riots had been national news, it didn’t need it. Smith was able to assume a huge amount of audience knowledge that simply isn’t there in 2019. But not every piece of art needs to be timeless, and Twilight: Los Angeles, 1992 cares far more about capturing a specific moment in aching detail. This is not a fluffy read. You have victims talking about how their lives have changed, people talking about how structural racism has broken their whole communities, officials trying to explain and justify their actions, and everyone else just trying to survive. (One of my favorite pieces is from a firefighter who describes how no firefighters were provided with bullet-proof vests, even though they were in the thick of the riots the entire time.) If you are at all unable to read descriptions of violence, this is not the play for you. But if you want to see a specific moment in US history that contains a lot of sickeningly timeless trends, Smith has you covered. 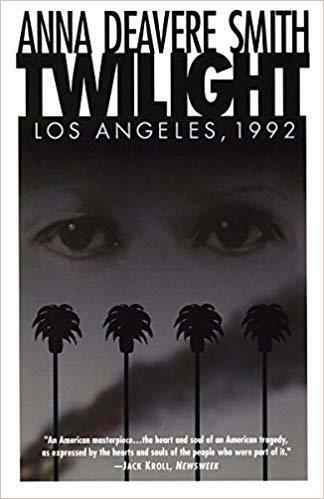 The names and dates have changed, but a lot of Twilight: Los Angeles, 1992 is far, far too familiar in 2019. Would I Recommend It: Yes, but go in cautiously. Previous Once Again, Come See my Staged Reading with “Monday Night PlayGround”!